The second of two special issues of IMEJ emanating from the 12th EWTEC held at University College Cork, Ireland, from 27 September - 1 August 2017. Wave / tidal resource characterisation. Wave / tidal device development, optimisation and testing. Wave / tidal hydrodynamic modelling and structural mechanics. Grid integration, PTO, control and electrical connections. Station keeping, mooring, material, fatigue, loadings. Environmental impact assessment and appraisal. Legislation, planning and codes, legal and political aspects of marine renewable energy. In addition to submitted articles, special issues emanating from associated and relevant conferences and meetings will also be published in the journal. 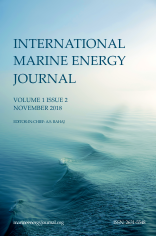 The IMEJ also welcomes review articles relevant to marine renewable energy topics as well as cross-cutting topics from other fields that are of relevance to wave and tidal energy.